At Wilmington Eye & The LASIK Center, we pride ourselves in having the capability to offer our patients a complete selection of vision correction procedures that can be customized to their unique needs and provide the best possible outcomes. That’s why we’re excited to offer the Visian ® ICL™ (Implantable Collamer® lens) at our center, an advanced vision correction option for our potential patients. To date more than 800,000 Visian ICLs have been implanted in patients worldwide. The Visian ICL is a thin, soft lens made of collamer implanted in the eye to permanently correct moderate to severe nearsightedness. The Visian ICL (Implantable Collamer Lens) is made of an advanced soft-material, composed of 100% biocompatible collagen copolymer, that provides not only UV protection and vision correction, but oftentimes can provide a quality of vision that is sharper, clearer, and more vivid than what one can achieve with glasses or contacts. Additionally, unlike LASIK, the Visian ICL procedure does not permanently alter the shape of your cornea. There is no maintenance associated with the lens, and it is intended to remain in place as long as you are satisfied with your vision. If at any point your vision changes or you wish to have them removed, it can be done and because your cornea is in its natural state, you are able to pursue other vision correction options. Vision improvement – eliminating the need for glasses or contacts. High Definition Vision: You can enjoy the quality of vision after ICL implantation that is sharper, clearer, and more vivid. Designed to be permanent, yet is removable: One of the compelling advantages of the Visian ICL is that while it can permanently correct your vision, the lens can be removed and/or replaced if necessary. Also, concerns involving the cornea typically do not apply to the Visian ICL, as no natural corneal tissue is removed or reshaped during implantation. Short recovery time: The recovery for the Visian ICL is relatively quick and pain-free. At the one week post-op visit, the visual acuity is often 20/20. UV Protection: Long-term exposure to UV radiation can damage your eyes, including the development of cataracts and some retinal problems. As an added feature, the Visian ICL advanced lens material contains a UV blocker that actually prevents harmful UVA and UVB rays from entering the eye, possibly preventing the development of UV related eye disorders. Treatment Flexibility for the Future: Your vision changes as you grow older and eventually almost everyone will need cataract surgery. An important benefit with the Visian ICL is that you have options for future treatments. Because Visian ICL maintains the structure of the eye, the measurements required for subsequent procedures are often more reliable and increase the predictability of outcomes. The Visian ICL procedure is an outpatient procedure that generally takes around 15 minutes, although you are at the surgical center a few hours because both eyes are treated on the same day. Prior to the procedure you will receive topical anesthesia drops to minimize discomfort. Then the doctor creates a small opening to insert the lens into the eye. Once the lens is injected, it unfolds in the eye and is tucked behind the iris (the colored part of the eye) and the procedure is completed! Patients experience vision improvement over the next few days and most patients are delighted at their ability to see without spectacles or contacts on post operative day one! I’m ready to find out if Visian ICL is right for me! What’s the next step? Schedule your complimentary ICL consultation with Kathleen Leone, MD, FACS today and plan to be out of soft contact lenses one week before the evaluation. Two weeks prior to surgery, Dr. Leone will schedule a procedure to prepare your eye for implantation of the Visian ICL. This is necessary to ensure the fluid inside your eye flows properly after your surgery. Dr. Leone will apply numbing drops to the eye before making tiny openings in the colored portion of the eye with a laser beam. After this procedure, you will be given eye drops to prepare your eyes for surgery. The day of surgery, you will be sedated at the surgery center and you will be given anesthetic and dilating eye drops before the outpatient procedure to minimize any discomfort. Then, Dr. Leone will create two micro openings in the edge of your cornea that will be used to insert and position the lens. Next the lens is inserted, gently unfolding in your eye. Special marks on the lens ensure proper positioning. That’s it – the procedure takes about 15 minutes! Because the opening is microscopic, recovery time is very short without needing any sutures. After the procedure, you’ll be seen back in Dr. Leone’s office. After surgery, Dr. Leone will prescribe eye drops to help prevent infection and inflammation. You will continue to use these drops for several days once you are home. We recommend you avoid swimming and vigorous exercise for one week after the procedure. You will have scheduled follow up visits with Dr. Leone and your primary eye care physician. Will I be able to feel the Visian ICL once its in place? Extensive research and development preceded the introduction of the Visian ICL. It is now being used by more than 800,000 patients worldwide. The satisfaction rate among patients is extremely high – above 99%. The Visian ICL provides unparalleled quality of vision and has excellent and stable outcomes for patients with moderate to severe myopia. 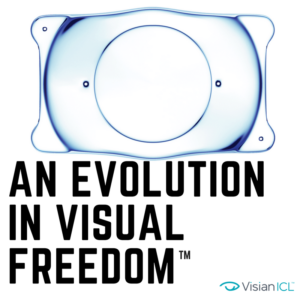 The Visian ICL has been available internationally for over 10 years and was FDA approved in the US in 2005. Yes. The Visian ICL received approval from the FDA for a wide range of myopic (nearsightedness) correction needs in 2005.